Your lawn creates the first impression to your premises. It’s the first sight anyone has to meet with upon going to your house, workplace or business place. Therefore, it is paramount that it is kept neat, trimmed and a vibrant green throughout the growing season. Tree Service Annapolis provide efficient Annapolis lawn care services to commercial customers and private residences to enhance the environment outside your home and business premises for a more welcoming look. The following are some of the vital steps included in our lawn care program. Aeration is the best fertilizer for your lawn. It enables air, oxygen and sunlight to penetrate through to the soil and this promotes proper lawn growth. Fertilization is the key determinant of the health and color of your lawn. Each lawn has a unique set of needs as soil type, grass species, and the local climate will differ. We strive to give your lawn the nutrients it needs to thrive depending on the different factors above. To ensure that your lawn turns out beautifully, professional seeding and grass seed of high quality is needed required. Our professionals see to it that they give expert advice for proper prepping in combination with the right equipment to get the job done. With the varying grass seeds available, they will suggest the best selection that will lead to strong roots and a beautiful lawn. Tree Services Annapolis strives to eliminate all pests and weeds that are detrimental to your lawn. Our Annapolis lawn care experts go a step further and offer you preventive measures to avoid reoccurrence and ensure that weed and pests are a thing of the past. 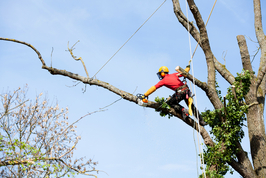 At Tree Services Annapolis, we take great pride in our services and that ensures we give the best Annapolis lawn care for your residences and commercial property. We have state of the art equipment to cater to small or large contracts alike. Our professionals are highly qualified, licensed and knowledgeable to handle any concerns you might have regarding your lawn service. Do not hesitate to contact us for your lawn care and maintenance needs.